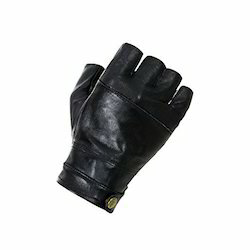 Men's fingerless black leather gloves with open knuckles. - These are the standard for riders or anyone who just wants to look cool! This pair of Biker Hand Gloves ensures a good grip and is extremely useful for frequent riders. Worn by gents riding bikes in summer to protect hands from sun-burn (sun-tan), to absorb pispiration. During winter to protect fingers from numbness. Being 100% cotton these gloves are odour free. 1. 3D breathable mesh fabric, comfortable to wear. 2. Ergonomic design with protective hard shell. 3. Neoprene embossed design for good grip.